Note: I do custom work and can incorporate your favourite pieces of glass into my mosaics! FInd me at my Etsy store! The above link will take you to a slideshow of my work on my Wordpress page. I've heard that some people can't see my images on this Ning site. Started by elizabeth May 3, 2016. Started by elizabeth Jun 11, 2014. Thanks to all at the Chemainus Theatre, where my work was featured for the month of May, 2016. https://elizabethtweets.wordpress.com/2016/05/04/i-recommend-pleasant/ Several pieces are still available there! "Memento" is the title of my glass on glass mosaic in Richmond BC (frame made by the Richmond Recycling folks). This sculpture is titled "Solstice" created by me (Elizabeth Wellburn) along with Samuel Houston and Deryk Houston who designed and fabricated the steel. It was first located in Nanaimo BC and has now moved to its permanent home at Woodwynn Farms in Central Saanich. In August 2012 Deryk and I were featured artists at Sooke Harbour House. Our exhibition together was called "Local Colour". This piece "Thank Your Lucky Stars" was one of the pieces available at Sooke Harbour House. I've done several commissions lately. I love these projects, often using elements from the glass collections of those who ask me to create custom pieces for them. This is a way to preserve glass objects that might otherwise go unused or even be discarded. For me, it's always a thrill to work with people's treasured items and give them a new life -- no longer are they sad and chipped dust collectors -- they are now part of a piece of art that can have a featured place in the home. My windows were on display in the Chemainus Theatre (July 20 through to September 3, 2011) coinciding with a production of "Fiddler on the Roof". The opening reception was July 29. Big thanks to all who attended. My work was also on display at The Old School House in Qualicum BC (Canada) during April 2011. The opening reception was a delightful evening and I thank all the staff at TOSH for their great support of the exhibition. 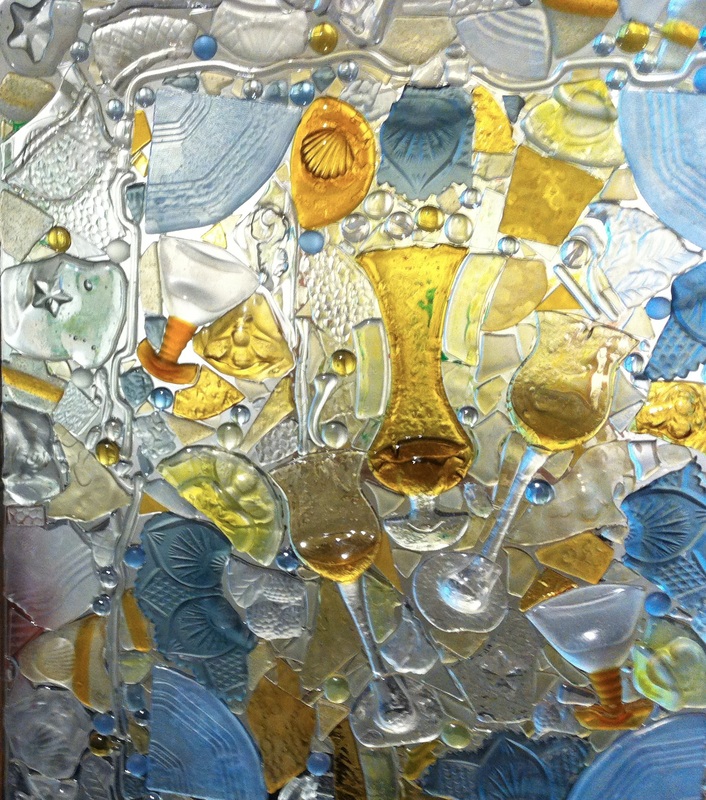 Also note that my work is included in a book published by Schiffer "Recycled Glass Sculpture and Design" edited by Cindy Ann Coldiron whose blog is at http://recycledglassanddesign.blogspot.com/. I start with discarded windows from heritage houses and work with chunks of recycled glass (chipped serving dishes, old stemware and scraps of glass from any source I can access). I kilnform the individual chunks to flatten, smooth and/or provide texture, and use a crystal clear two-component epoxy to adhere the chunks to the original window. The results are very three-dimensional (relief) and of course they transmit light in the way that a stained glass window would. I melted my first piece of glass about five or six years ago at a workshop in the wonderful “Starfish” studio that used to be on Yates Street in Victoria. Since then I have been passionate about glass as an art form, with a special interest in recycled materials. My work is created from discarded bottles, chipped serving dishes and old stemware along with small scraps of glass from any source I can access. My studio is now in my home, and I have scoured the internet to learn as much as I can about kilnforming and other glass techniques. One of my favourite “precision tools” is a sledgehammer and my kiln runs most days of the year. RECENT WORK: I have work accepted in both the Sidney and the Sooke Fine Arts exhibitions. I have created many pieces with recycled titles related to movies, as the concept of recycling doesn't have to end with the physical materials used in the work. My piece at a recent Sooke Fine Arts Show was titled “It’ll Be a Whole Garden”, quoting a line in a favourite movie (“It’s a Wonderful Life”). That title represented the power of human imagination, and comes from the moment when George Bailey (Jimmy Stewart) tells his little daughter Zuzu (Karolyn Grimes) that if she sleeps, she’ll be able to dream about her prize flower and visualize it in a new way. For me, the transformation of chunks of broken glass into an image that approximates a floral or folk-art inspired design (with the help of handmade molds, and 1400o F of kiln heat) has it’s own dream-like quality. BACKGROUND: Although my very first post-secondary experience was in an art program at Langara College in Vancouver, I drifted into education, obtaining an MA in Educational Psychology which led to a career in education technology. But technology is something I see as a means to an end. Information literacy and critical thinking are what I believe should be the main goals of education in this information–rich era, along with the things that make us human (like the arts) and allow us to connect in important ways. Several years ago I wrote a children’s book (“Echoes from the Square”) with the power of the arts as its theme. elizabeth created this Ning Network. This is a "ning" social media site, but you don't have to join or sign-in to have a look around at the images of my glass-on-glass mosaics. Detail from "Pear Shaped Tones"
Detail from: "It's a Wonderful Life"